bridal beauty - Emilie Inc.
During the summer, my husband and I became consultants for the fastest growing skincare company in America, Rodan + Fields. Founded by the powerhouse dermatologists who founded Proactiv, this revolutionary anti-aging system is changing skin and changing lives. There’s no bigger day than your wedding when you want your skin to look flawless for photos. And I don’t just mean brides! Same goes for grooms, maids and moms! 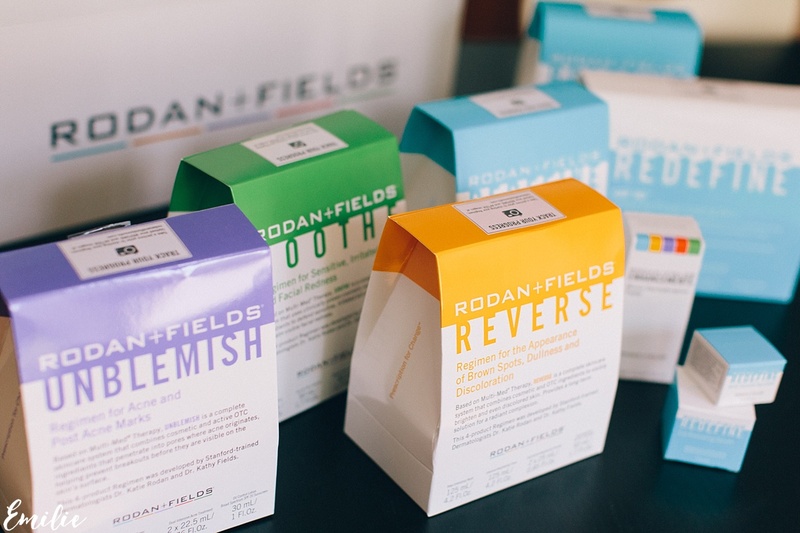 Four multi-step regimens offer solutions for fine lines and wrinkles (REDEFINE), sunspots and dark circles (REVERSE), acne (UNBLEMISH) and sensitive skin (SOOTHE). There’s something for everyone! Used twice daily, customers are seeing results in a matter of days!! Plus, with an incredible 60-day money-back guarantee, there’s no risk. So what am I seeing as the most popular products? Obviously, the cornerstones of the brand are the four regimens that tackle a host of skincare issues. I use UNBLEMISH in the morning, REDEFINE at night. My husband is using SOOTHE. And my mom is using REVERSE. We’re all thrilled! Magic in a jar! This helps reduce dark circles, puffiness and fine lines and wrinkles. This is a little wheel with needle-like points on it that stimulate collagen production (did you know your body stops producing collagen on its own once you hit 30?!) to tighten skin, and allows products to penetrate better. I use it nightly on my face, neck and chest. Cover up those tan lines, ladies! I also use R+F body lotion. I think the thing that has astounded me the most is how many people are able to go without make-up after they have been using R+F products for a while. Until then, I have been using their mineral peptides that deflect light to help even my skin tone (and also provide sun protection and help protect my skin from environmental irritants). I’ve seen brides dab this on before walking down the aisle for one final brightness boost. I never imagined I would be selling skincare as a side gig, but you know what? It’s so much fun! And it’s easy to talk about when I love the products. If you’re curious about the business, I’d love to chat anytime! Wouldn’t it be wonderful if we were business partners together?! You can follow along on our journey on our skincare blog here.